From PADI Open Water Diver to PADI Instructor, earn an international PADI qualification which allows you to dive anywhere in the world. 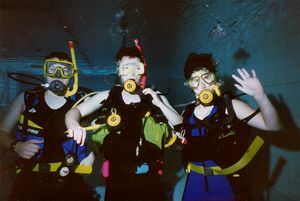 Learning to dive is a process, so you will be encouraged to dive after your course at no extra cost. You will receive the personal touch with an absolute maximum of 4 students to one instructor per course. 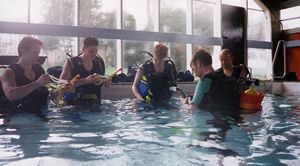 The scuba courses include all equipment hire and all course materials, so there are no hidden costs. 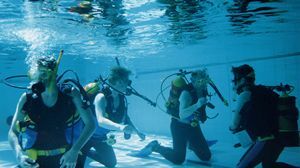 Ensure you like diving first by trying an introductory Discover Scuba Session! "I could not believe how straightforward it was. I found the feeling of weightlessness amazing and found the insruction to be very reassuring." Broaden your experiences and equip yourself with the tools to explore a variety of exciting new areas within Scuba diving. "Thank you very much for a fantastic Night Dive. In my son's own words, AWESOME!" Garry Moffat, Night Dive Speciality, Loch Long. You can be assured of a first class education as we have already been awarded 5 PADI certificates for outstanding customer service and professionalism in Scuba instruction. "All the instructors are ambassadors for professionalism and the PADI organisation." Robert Eadie, Assistan Instructor course. Boat excursiona are continually available to put your training into action on some fun dives! "Overall this has been an amazing trip and one I would certainly wish to do again." John Fraser, Scapa Flow, Orkney Isles. Visit world-renowned diving destinations. Everything is arranged for you: just turn up at the airport with your passport! "Again, service is the key. I wanted to learn to Scuba dive in the hands of an expert. That is why I went on the trip and that is the experience I had, with the added bonus of much pleasure and some new friends. As to the diving itself, I felt that a whole new world was opened up to me. It was the best holiday I have ever had!" Peter MacKay, Open Water Course in the Red Sea, Egypt.